Preheat oven to 425 degrees then line a baking sheet with foil. Toss the diced potatoes in the olive oil and spices in a bowl until evenly coated. Lay it out in an even layer on the prepared baking sheet. Roast the potatoes for 13-15 minutes or until it is fork tender. Rinse and drain the quinoa then put it in a medium sized sauce pan with the broth and 1/4 teaspoon of kosher salt. Bring the quinoa to a boil, then cover it with a lid and lower the heat to medium low. Remove from the heat and season the quinoa with the remaining 1/4 teaspoon of kosher salt, chili powder, cumin, garlic powder, lime juice, and cilantro. 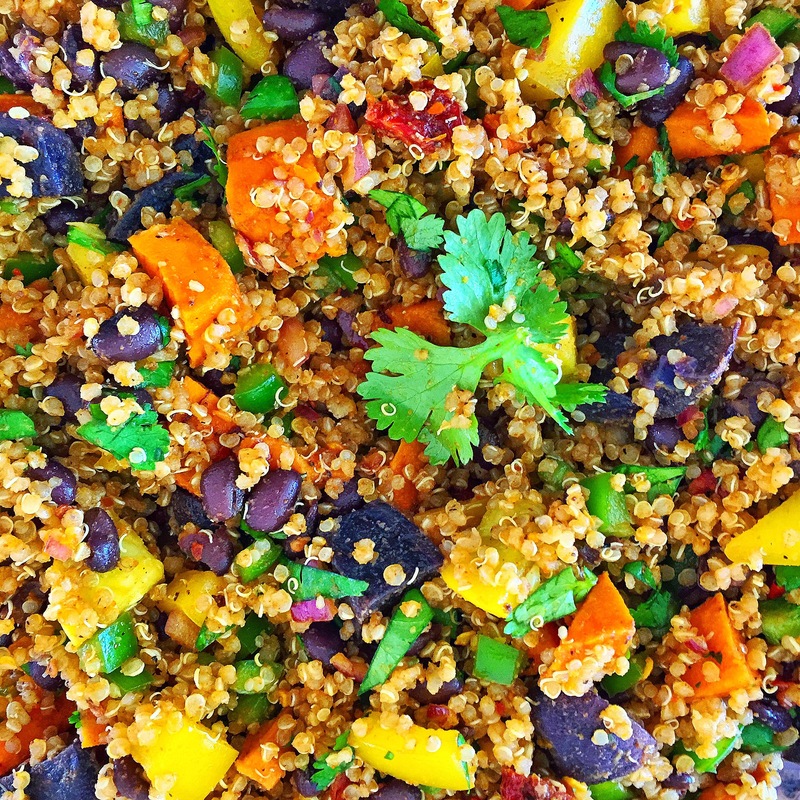 Place the quinoa in a bowl and add the black beans, yellow & green peppers, squash, sun-dried tomatoes and mix until blended. Fold in the roasted potatoes, adding more spices to suit your desired taste. Top with avocado and cilantro to serve. Made in bulk and saved in an air-tight container, this dish can last for several days. Place it in a bowl on its own or mix with your favorite protein or layered inside a wrap – the possibilities are endless with this Rainbow Quinoa Hash!